The Super Bowl has passed, and to be honest I do not think that any one of us in my family actually cared. Sure, the boys said ‘I want the Patriots to go down!’ a few times that day, but the only thing I really cared about was what we were going to snack on. I am done asking, for the most part, what everyone would like to eat, and just lay things out. My menu was simple. Slow baked ribs that would be later fried and glazed, and loaded potato skins that would also be fried. 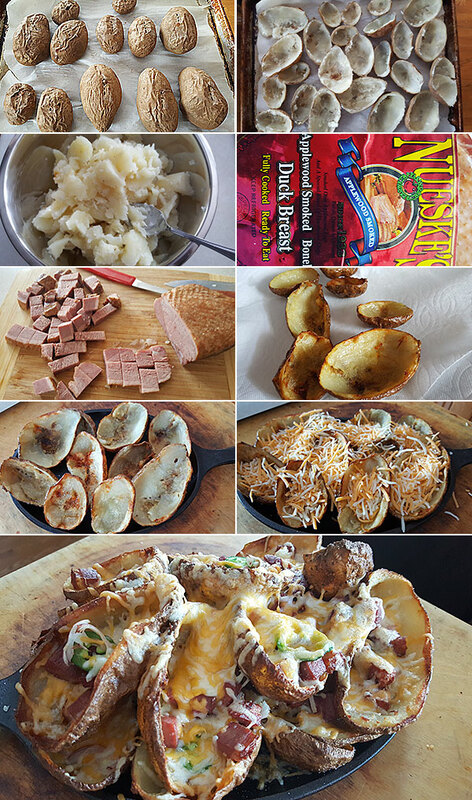 One of my top recipes is the loaded potato skins, and as I have made so many awesome variations of potato skins, there is one thing I have never done and that is to actually fry the skins. It’s a total game changer. Why? Well because you get a whole shell of that awesome crispy and crunchy texture, not just on the edges, but the entire shell. It’s almost chip like in texture, but with a bit, and just a bit of that creaminess from the potato. As with any nacho, you load this as you darn well please, but for me, there was one ingredient that made this shine and that was crispy, Nueske’s smoked duck breast lardons. Again, you can build your nachos however you want. Add beans and tomatoes if you desire. Load these suckers up! Start by preheating your oven to 400 degrees. Add the whole potatoes to a baking sheet. Use a fork and poke a few holes into each potato to allow steam to release while baking. Bake the potatoes for 50 minutes to 1 hour. Remove from the oven, and let them completely cool. Once the potatoes have cooled, sliced them in half, lengthwise. Use a spoon and gently scoop out all of the potato into a bowl. I use all of the potato, add a bit of butter, salt, and milk and whip them up to mashed potatoes for another meal. Once you have all of your skins ready, heat up a pot with the canola oil. Get the oil to 350 degrees on medium-high heat, and once you have your temperature, drop in about 7-8, or whatever can easily fit into the pot without crowding, and cook the skins for about 5-10 minutes or until you begin to see the interior of the skins get golden and nicely crisp. Using a slotted spoon, remove the potato skins and place them on a paper towel lined plate to release any excess oil. Immediately season by showering the skins with salt. Taters need salt. Repeat with the potato skins. Add the skins to a oven safe baking pan, and begin adding cheese into each skin. When all of the skins have finished cooking and the excess oil is removed and they are nicely salted, layer the potato skins onto the baking pan and continue to add cheese into each shell. Keep the oil on the stove, and take the cubed Nueske’s smoked duck breast and add them to the oil. Get them lightly crisp, then the same process with the slotted spoon and place onto the paper lined plate. Take those Nueske duck lardons and place a couple into each shell. If you are using bacon, cook until slightly crisp, then crumble and add that into each shell. Add the shallots into each shell, then place back into a 400 degree oven for about 10 minutes or until the cheese is nicely melted. Remove the potato skins from the oven (do not devour), then decorate them with green onions, avocado, cilantro, serrano chilies, olives, hot sauce, and sour cream (or whatever you desire). Plate and serve. You want to talk about an ultimate game day snack, this is the one! As much as we all love nachos, this loaded potato skin nacho recipe is really, really hard to beat. 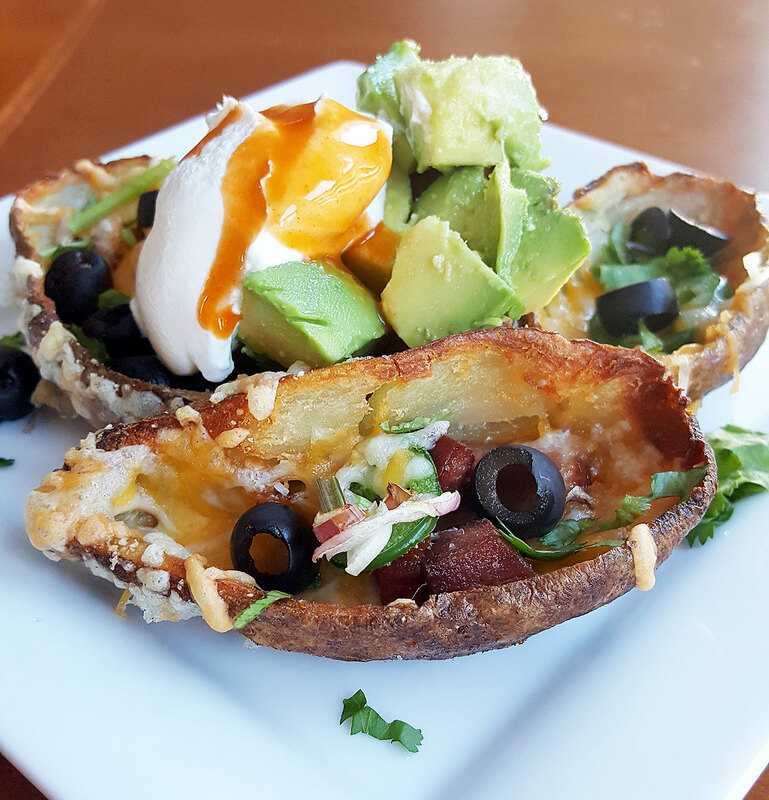 It’s everything you love about a nacho but in a crispy potato skin boat! Hope you enjoy!